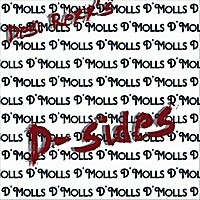 Ex-Atlantic Records recording artist D’Molls are back with a new 2011 album under the moniker of Desi Rexx’s D’Molls. The new album, aptly entitled ‘D-Sides’, is a collection of B-sides, rare tunes and unreleased material — and is available for purchase at www.fnarecords.net and www.cdbaby.com. The 18 track album takes the listener on a wild (pre-seat belt) roller-coaster ride through some classic D’Molls tunes and then down around the bend with some tracks that will delight, surprise, and titilate. The one constant throughout is the mesmerizing and catchy blues rock vocals of lead singer Desi Rexx — the same vocal stylings that have made D’Molls a cult favorite straight out of the Midwest hard rock scene. ‘D-Sides’ features some notable talent from the hard rock world including Andy Parker of UFO, Chip Z’Nuff of Enuff Z’Nuff, Mick Sweda of the BulletBoys, Bobby Barth of Axe, John Thomas of the Lita Ford band, P.J. Smith of No Sweat, and Danny Johnson who has played with Alice Cooper, Rod Stewart, Derringer, Steppenwolf, and Axis. ‘D-Sides’ opens with a toe-tapping, finger snapping bluesy ditty entitled “Snazzy Shoes” that could easily have been a bonus track for either of the two Atlantic Records albums. Without missing a beat the album soars into a handful of rockers starting with “M-O-N-E-Y” featuring Bobby Barth from the band Axe. The following 3 tracks, “All I Want”, “HI ‘n’ LO” and “Crimes Of Fashion”, are the original 3 song demo sessions that got the band signed to Atlantic Records back in 1987. The remainder of the album features fun and collectible rarities and rockers, and even a ballad or two for all of you slow dancers. From his Glam-O-Rama days with St. Valentine and D’Molls, through his whirlwind ride as guitarist for David Lee Roth, down to his ‘Still on tour doin’ what I love doin’ second best!’ present, Desi Rexx has remained the consummate entertainer both live and in the studio. In these uncertain economic times, one thing is certain: There is no better value for your ‘Hard Rock Dollar’ than to get yourself a copy of this particular CD at www.fnarecords.net.